You’ll get a more comprehensive look at these clarinets in the review’s sections, but for now, let’s focus on some basic knowledge to help guide you in making the right choice that fits all your clarinet needs. How Do I Choose A Clarinet? What Are The Best Clarinet Brands? The five most common types of clarinets are the Bb, the A, and the E in the soprano family, and the Contra-Alto and Contra-Bass in the bass clarinet family. There are others, but these are the most common. Traditionally, the clarinets found in most school bands are in the key of Bb. 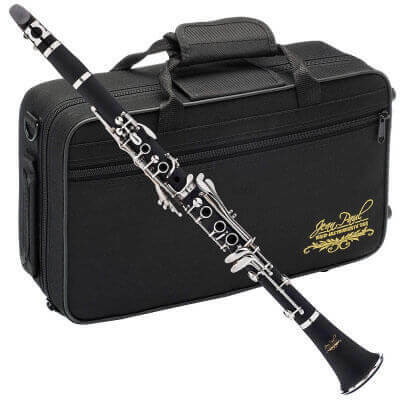 The key of Bb is known as the best clarinets for students because they are the easiest to learn and work with. So, if your student is a member of the band, this is probably the best option. 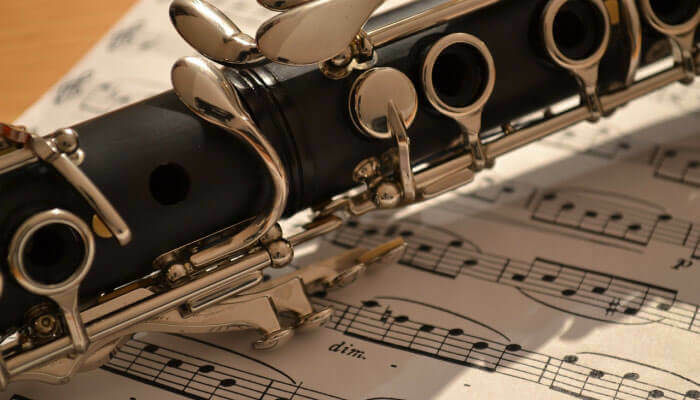 In addition, other factors to consider when determining the best clarinet combine personal the player’s needs with cost, durability, playability, and sound. Clarinets are either made of either plastic materials or they are wooden. In terms of durability, plastic models are going to hold up better against dropping and other rough handling, making them more preferred for beginners and younger students. A marching band student may also consider plastic over wood, given how much they move, and they may have a higher risk of dropping their instrument as well. Wooden clarinets are more fragile but there’s an argument to be made that they also produce a better, warmer sound. Not that you can’t get great sound from a plastic model, because you absolutely can. If you’re student is more responsible or runs less risk of dropping, a wooden clarinet is definitely a great choice. Clarinets can range from less than $100 to over $3,000 so it really does depend on what sort of investment you are personally making for yourself or your student. More expensive models should be considered long term investments. However, you may find a cheaper clarinet meets your needs better. There are also many clarinets to consider right in the mid-range, combining both budget needs and quality construction. These are a few things to keep in mind when making your decision. Here is a list comprised of different models at different price points to give you an idea of what’s out there to choose from. With any luck, you’ll find exactly what you’re looking for! If you or your student are just starting out and you’re concerned about making a major investment, this is by far the best budget clarinet. At under $100, this little gem has a high-grade ABS plastic body and nickel-plated keys with an adjustable thumb rest. It comes with a complete starter set including a lightweight handled case, a box of 10 reeds, grease, and a cleaning cloth, gloves, and a stand. It comes with a 1-year warranty against manufacturer’s defects which is probably a great addition when considering it’s the cheaper model. It certainly makes a statement. Its finish is a gorgeous glossy sky blue, which is sure to stand out in the sea of black and wooden clarinets you usually see. There have been a lot of complaints about sound quality. If you were just learning on your own, maybe this isn’t a big deal. However, if you’re playing in a band, and need to be in tune with other instruments, this may present an issue. Perhaps due to its price point, durability is a concerning factor. This probably won’t make a good long-term choice. Because it’s cheap, you’ll likely have to replace it after a while. If you’re looking to just start making music again, or your beginner just wants to try something new, this is a great option. With little investment, you can get a good clarinet for a beginner. However, if you’re an intermediate player or part of a band, this may not be the instrument for you. Jean Paul is often regarded as one of the best student clarinet brands on the market. At a relatively low price point, it is made of ebonite and produces a better sound than plastic but is more durable than a wooden clarinet. The Jean Paul CL-300 features a Boehm 17-key system and is in the key of Bb, so it is very versatile. It’s a common brand and can be found in most music stores making it a quality choice for a well-rounded student. It’s durable and produces high quality sound at the same time so it would be perfect for a marching band or other similar environment. It is the standard Bb (B Flat) and will accommodate any high school band’s range. This particular model is prone to keys bending so it is not ideally suited for younger players. The Jean Paul USA CL-300 is a solid choice for a student player, one who isn’t too young but still may not be ready for an intermediate or wooden clarinet. It’s a wonderful “middle of the road” clarinet, one that is inexpensive but also produces a better sound than a different plastic one in the same price range. The Medini MCT-30 has a beautifully crafted solid rosewood body with durable silver-plated keys and an adjustable thumb rest. Being wooden, it produces alluring quality sound. This is an ideal choice for beginners and intermediate players who would prefer a wooden clarinet. In our opinion, the MCT-30 is the best budget wooden clarinet on the market. At around $250, it is still a relatively inexpensive option but is also wooden, so you’re going to get great sound quality for your money. It comes with a hard-shell case for enhanced protection of this more delicate wooden clarinet. The Medini MCT-30 Intermediate Solid Rosewood B Flat Clarinet is a popular and easy to find brand. This wooden clarinet is less durable than plastic clarinets, so the player needs to be more careful when handling this instrument. Because it is made of wood, it expands and contracts with temperature changes, so it requires more maintenance than plastic. This is often the case with wooden brand clarinets. The Medini MCT-30 is a standard Bb clarinet so it’s very versatile and common. Given it’s a wooden clarinet, you’re going to get better sound quality, even if you must sacrifice a little in the durability department. While it requires more upkeep than plastic, for a well-rounded beginner or even an intermediate player, it’s definitely worth it. If you’re sold on the idea of having a wooden clarinet, but still not ready to invest thousands of dollars, the Cecilio CT-380 clarinet is a great option for you. Coming in at under $500, it has a solid rosewood body and durable silver-plated keys with quality Italian pads and an adjustable thumb rest. This is still a relatively inexpensive model, as most wooden clarinets are more expensive. This instrument is going to provide rich sound and full volume in standard Bb key which will accommodate many settings. The Cecilio CT-380 comes with a hard-shell case for optimal protection and a 1-year warranty against manufacturer’s defects. This Cecilio clarinet is slightly heavier and has a larger body construction for a more comfortable feel when holding and adjusting the instrument. Wooden clarinets do require more maintenance than plastic ones, so this may not be suitable for younger students. The Cecilio CT-380 is a great wooden clarinet option. The Cecilio brand is top-rated and well known so you know you’re getting a quality instrument. The slightly heavier and larger construction may not be as well received by younger players or those with smaller hands and frames, but it will be more comfortable overall for most players. Being a wooden instrument, it has less durability but better sound quality. It is in the versatile Bb range, so it is perfect for high school students and marching bands. All things considered, the CT-380 is the best wooden clarinet under $500. The Yamaha YCL-255 is a state-of-the-art plastic clarinet. Its high quality produces warm tones like its wooden counterparts. It also has a matte finish which makes it look and feel similar to a wooden clarinet. It has silver plated nickel keys and a durable Valentino pads that is easier to maintain and repair when compared to the temperament of wooden clarinets. The YCL-255 is the best plastic clarinet for beginners and intermediate players. This instrument produces a high-quality sound and is a top-rated plastic clarinet for beginner and intermediate players. It has a more durable ABS resin body with matte finish, so you get the durability or plastic but the visual beauty of a more wooden appearance. It’s modeled after professional level Yamaha models so at around $700, it has great value for the serious student. The Yamaha YCL-255 clarinet is more expensive than many beginner models, so it may not be within your budget to invest. Being plastic, you may still hear and feel a difference when compared to wooden clarinets. The more advanced player would notice a difference. The Yamaha YCL-255 Standard Bb Clarinet is truly the best of both worlds. Its ABS resin body is more durable, but its matte finish gives it a more sophisticated appearance. It has a top-quality sound, producing warm tones, similar to a wooden clarinet. While it is more expensive than many beginner brands, you may consider this model for a more long-term investment as it will not need to be replaced like less expensive models. As the player transitions from beginner to intermediate, this instrument will be able to transition with them. The Yamaha YCL-255 is modeled after professional level Yamaha clarinets and is also in the most popular Bb range for versatile use. The Jupiter JCL700N student clarinet is made with an ABS resin body making it extremely durable and impervious to cracking so a change in temperature is nothing to fear. It has a smooth matte finish for a more sophisticated look and durable nickel keys with an adjustable thumb rest, which are features on more expensive models. This would be great for a high school marching band student or younger student who may be more likely to drop it. This model provides rich, full tones for a high-quality sound coupled with the durability of a plastic. The matte finish and adjustable neck strap give the instrument a more comfortable and professional feel when playing. This is a more expensive model when keeping in mind it is a plastic clarinet instead of wooden. There were not as many customer reviews for this model but did have 100% positive feedback. Given it is a plastic clarinet, it may not have the same sound as a wooden clarinet. The Jupiter JCL700N is a perfect option for your serious student. At under $800, you get great value, combining balance between quality and price. It’s mechanically reliable and well-built so you’re sure to get many years of use out of it before you have to consider a replacement. The JCL700N might be the best clarinet for high school students. The Cecilio CT-480 clarinet is a great option for your improving student. Your middle or high school student can play rich, full tones through this solid ebony body clarinet. It features silver plated keys and Italian pads plus an adjustable thumb rest. In our opinion, the CT-480 is the best wooden clarinet under $600. It features a solid ebony body construction for better sound when compared to plastic clarinets. At an intermediate level, this instrument will accommodate needs as your student improves and grows. It may not be the best option for a younger student, given its less durable wooden construction. It is more expensive so while it may not be the best option for a beginner. The Cecilio CT-480 is a beautiful instrument. It’s well-crafted black ebony wood body will provide a lovely sound. While it may not be the best pick for a younger beginner, it’s a wonderful choice for a serious student who wants to continue to improve their craft. Although made in the USA, the Selmer CL211 clarinet features a grenadilla wood body and silver-plated keys in the Boehm (French) key system, plus a smaller bore, undercut tone holes, and blue steel springs with an adjustable thumb rest. The internal design of the Selmer CL211 is comparable to many professional level handmade clarinets. With carefully located tapers and straight sections, this model has a smooth, consistent sound. The CL211 might be the best clarinet for the serious intermediate student. This high-end model features many impressive touches, providing the player with a quality instrument that will impress the ears. Being a wooden clarinet of such a caliber, you’re not going to have to worry about defects or replacements for a long time to come. If you’re beginner or student doesn’t have any experience at all, this machine may be too much of an investment up front. It’s relatively expensive compared to some other models, but still worth its quality. With is being a wooden clarinet, it will require more regular maintenance and cleaning than a plastic clarinet. While the Selmer CL211 may not be the perfect instrument for a beginner, it would be a solid choice for a more advanced student who wants to invest in a quality instrument. Your high school band student who plans to continue playing for a long time to come would rest easy with this clarinet at their fingertips. While the Yamaha YCL-650 is listed as a professional level clarinet, at under $2,000, it is still a reasonable option for your serious advanced student. This model features a grenadilla wood body with silver-plated key work and a cylindrical bore design which makes it very easy to tune. As your student becomes a more advanced player, this instrument will transition from intermediate to professional with ease. This model is going to produce amazing sound and you’re going to be able to feel the quality in your hands as you play. This model is more expensive and may not be a suitable option for a beginner, or someone more prone to dropping their instrument. This wooden clarinet will be less durable than a plastic clarinet. The Yamaha YCL-650 is a wooden clarinet so it will require more regular maintenance and cleaning than a plastic clarinet. Although the Yamaha YCL-650 is a more expensive option and may not be ideal for a beginner, it’s a perfect option for the more advanced student at a reasonable price for the quality you’re getting. Being a wooden clarinet, it is going to produce a beautiful, warm sound. The professional level craftsmanship is going to guarantee you will not have to replace this instrument for a very long time. At the end of the day, the YCL-650 is the best professional level clarinet at budget price. Did you find what you’re looking for?! Whether you’re a young beginner, a middle or high school student, or a serious advanced player, there are many options out there for you to choose from. Hopefully you got all the information you needed from the clarinet reviews provided to make the right decision. 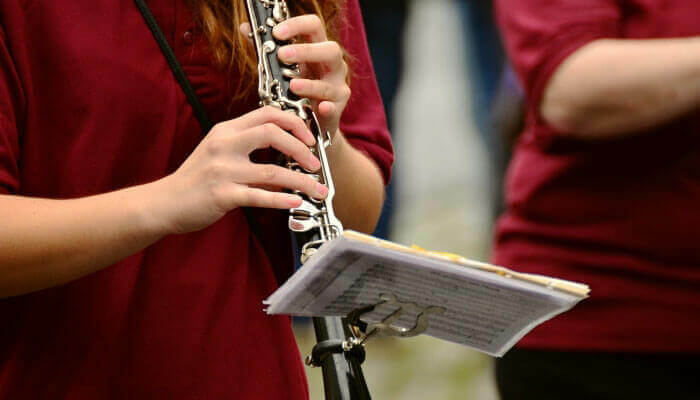 With a wide array of both plastic and wooden clarinets over an even wider price range, it should be much easier to decide what you need in your clarinet. Do you need the durability of plastic? Do you want the sound of a wooden clarinet? Is this a hobby or an investment in years of playing to come? Whatever your wishes, you’re now a more educated buyer and your clarinetist will definitely be more satisfied with their instrument.